We all know I love to have fun with my style (take a gander at my previous outfit post if you don't believe me!) and my new 'thing' is novelty bags. 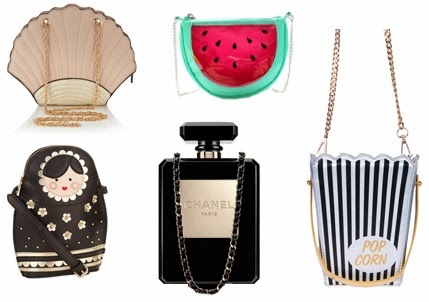 I currently own the watermelon one and I find myself wondering how I can incorporate it into every outfit I wear. I also couldn't post about novelty bags without including the gorgeous, rare Chanel perfume bottle bag- available in clear white or black acrylic. Its stylish, incredible, seen on the very top fashionistas (I'm looking at you RiRi and Cara Delevingne!) and, well, $9,500 and up. A girl can dream, very, very big if she so wishes. But take a look at my other picks, all equally (well....) lovely and all under £40- phew, thats a price tag I can fathom.